The ozone hole over Antarctica grew relatively large in 2015, according to data acquired by the Ozone Monitoring Instrument (OMI) on NASA’s Aura satellite and the Ozone Monitoring and Profiler Suite (OMPS) on the NASA-NOAA Suomi NPP satellite. On October 2, 2015, OMI observed that the hole had reached its largest single-day area for the year. The image above, based on data acquired with OMI, shows the hole on that day. It spanned 28.2 million square kilometers (10.9 million square miles)—the fourth-largest area measured since the start of the satellite record in 1979. The largest single-day ozone hole recorded by satellite was 29.9 million square kilometers (11.5 million square miles) on September 9, 2000. The ozone “hole” is not literally a hole; rather, the phenomenon is defined as the area where the concentration of ozone drops below the historical threshold of 220 Dobson Units. In the image above, those areas are purple and blue. The ozone depletion phenomenon is seasonal, starting each year during the Antarctic spring and peaking between mid-September and early October. In 2015, the hole started slowly but then quickly expanded to cover a large area. The average size in September–October 2015 was 25.6 million square kilometers (9.9 million square miles)—also the fourth largest since the start of the satellite record. The largest September–October average on record was 26.6 million square kilometers (10.3 million square miles) in 2006. In 2015, ozone concentrations also plunged lower than in recent years. On October 4, ozone reached an annual minimum concentration of 101 Dobson Units. While the ozone hole area was large in 2015, the size was consistent with what scientists know about ozone depletion and chemistry. According to NASA atmospheric scientist Paul Newman, there are still plenty of ozone-depleting chlorine and bromine compounds present in the stratosphere. Moreover, the lower stratosphere was colder than in previous years, which creates favorable conditions for ozone-depleting chemical reactions. Visit World of Change: Antarctic Ozone Hole to see how the holes have evolved since 1979. NASA Earth Observatory (2015) World of Change: Antarctic Ozone Hole. NASA Goddard (2015, October 23) Ozone Hole Watch. Accessed October 26, 2015. NASA Goddard (2015, October 22) NASA Study Shows That Common Coolants Contribute to Ozone Depletion. Accessed October 26, 2015. 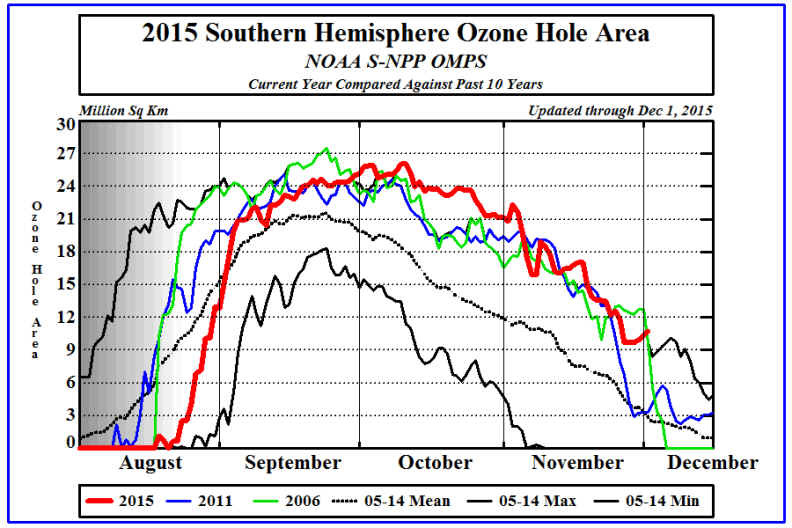 NASA Goddard (2015, October 7) 2015 Antarctic Ozone Hole Area Approaches Annual Maximum. Accessed October 26, 2015. 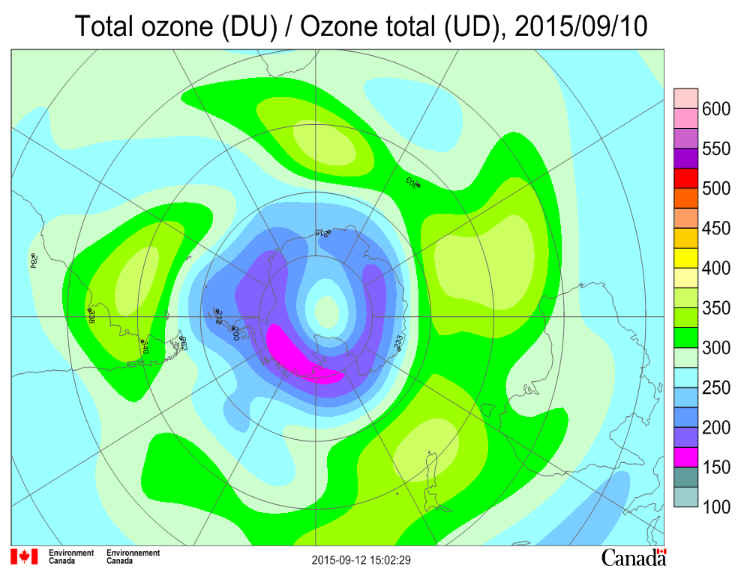 Ozone Monitoring and Profiler Suite blog (2015, October 11) The Ozone Hole for 2015. Accessed October 26, 2015.Caption by Kathryn Hansen. Antarctic ozone today: The 2015 ozone hole is over. 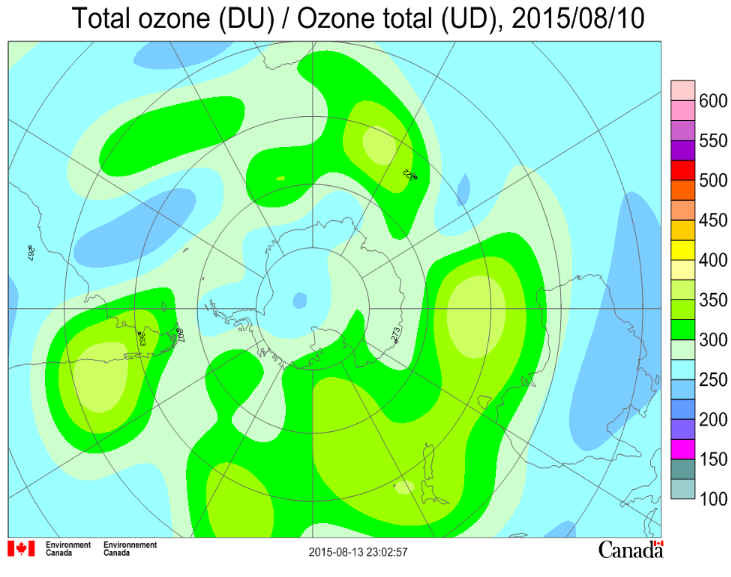 The ozone distribution is that of the summer with ozone amounts more uniform over the continent. Values currently range from around 270 DU to around 350 DU. There are significant differences between the various satellite measurements. In the lower half of the ozone layer temperatures are near their summer peak. At the highest level the temperature has passed its summer peak and is now cooling. Temperatures in the ozone layer are well above the threshold for Polar Stratospheric Cloud (PSC) formation. The 2015 ozone hole: Meteorological conditions were favourable for the creation of a significant ozone hole, with a stable polar vortex and a cold stratosphere. Ozone hole levels were briefly reached over the Antarctic Peninsula on August 5 and over Halley the next day in a dynamic event. Significant ozone depletion over the continent began in mid August as the sun returned. Depletion became more widespread by September, exceeding the mean for the last decade and greater than in the last couple of years. Ozone declined by about 1% per day near the centre of the ozone hole. 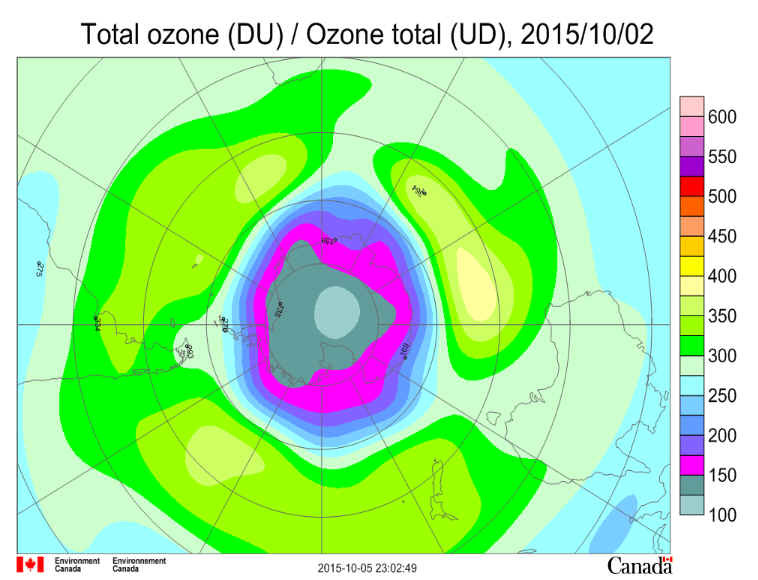 The ozone hole peaked at some 26 million square kilometres in the first half of October. 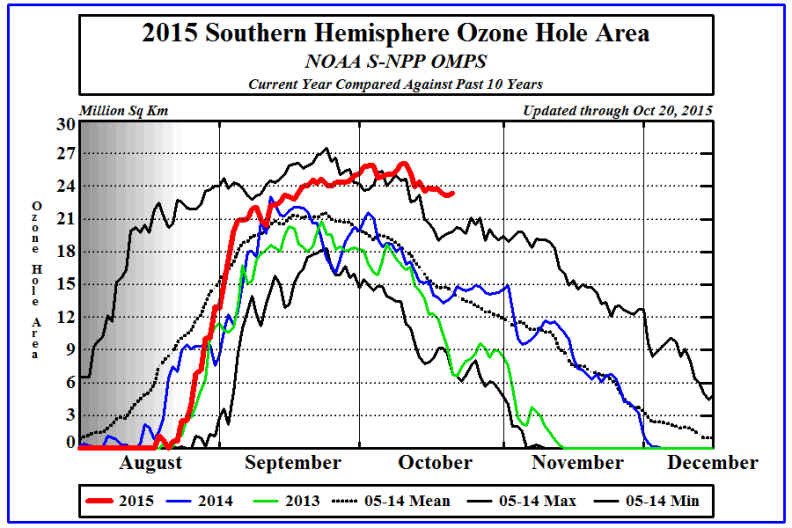 It was the largest ozone hole ever for the time of year in the second half of October. It became more elliptical in early November, affecting the Falkland Islands and South Georgia over November 4 and 5, and again around November 20 to 23. It remained amongst the largest of the decade into mid December. The polar vortex was the largest over the past decade in the upper part of the ozone layer from July to October and the area with PSCs was also larger than average during this period. At lower levels the vortex was largest ever, by a considerable amount, from October and into December. There is no evidence for any effect on ozone values from aerosol from the eruption of Calbuco in southern Chile in late April. Most, if not all, of the volcanic aerosol remained north of Antarctica. Antarctic ozone today: Ozone depletion remains extensive and the ozone hole still covers a large part of Antarctica, centered on Dronning Maud Land. The ozone hole is slowly beginning to shrink and fill and is now around 11 million square kilometres, still much larger than the average over the last decade and close to or above the extreme. The ozone distribution is that of late spring with ozone amounts over the continent recovering from their minimum, and higher values around the Southern Ocean. Values currently range from around 170 DU over Dronning Maud Land, to around 350 DU over parts of the Southern Ocean. There are significant differences between the various satellite measurements. Through most of the ozone layer temperatures are much below the long term average, particularly in the lower part, but are warming. At the highest level the temperature has reached its summer peak. Temperatures in the ozone layer are above the threshold for Polar Stratospheric Cloud (PSC) formation. The polar vortex remains much larger than average in size, particularly at the base of the ozone layer, but is shrinking. The ozone hole is entering its final phase and is expected to continue to shrink in area and to fill, but will last into mid December. Antarctic ozone today: Ozone depletion remains extensive and the ozone hole still covers most of Antarctica, centered on West Antarctica. The edge of the ozone hole is likely to affect the tip of South America and the Falkland Islands during the week. The ozone hole is slowly beginning to shrink and fill and is now around 16 million square kilometres, still much larger than the average over the last decade. The ozone distribution is that of late mid spring with ozone amounts over the continent beginning to recover from their minimum, and higher values around the Southern Ocean. Values currently range from around 150 DU over the interior, to over 400 DU over parts of the Southern Ocean. There are significant differences between the various satellite measurements. Through most of the ozone layer temperatures are much below the long term average but are warming. Temperatures in the ozone layer are now above the threshold for Polar Stratospheric Cloud (PSC) formation but some PSCs may still exist. The polar vortex remains much larger than average in size, but is shrinking. 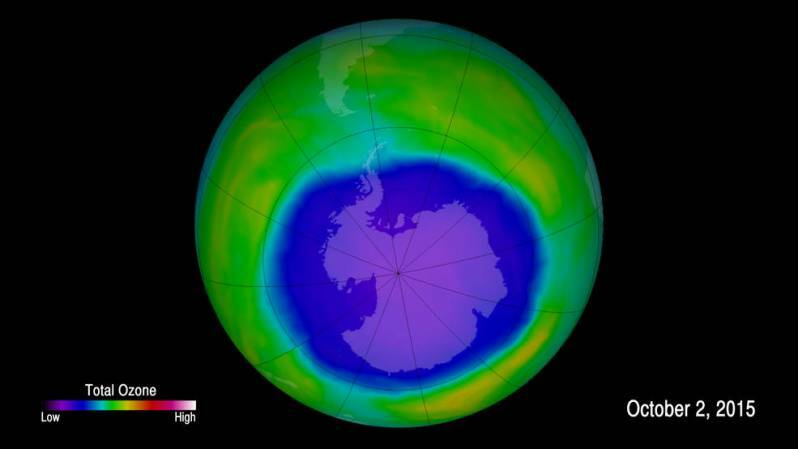 The ozone hole is expected to continue to shrink in area and to slowly fill. The 2015 ozone hole: Meteorological conditions were favourable for the creation of a significant ozone hole, with a stable polar vortex. Ozone hole levels were briefly reached over the Antarctic Peninsula on August 5 and over Halley the next day in a dynamic event. Significant ozone depletion over the continent began in mid August as the sun returned. Depletion became more widespread by September, exceeding the mean for the last decade and greater than in the last couple of years. Ozone declined by about 1% per day near the centre of the ozone hole. 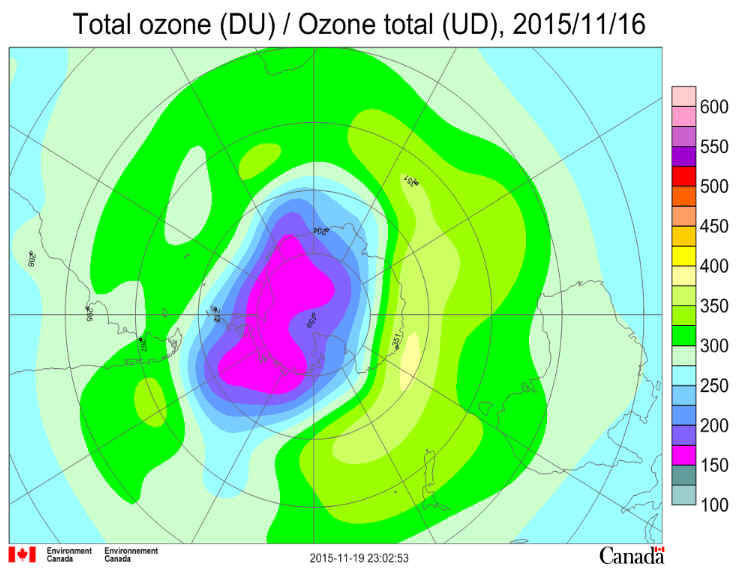 The ozone hole peaked at some 26 million square kilometres in the first half of October. Halley station saw its lowest ozone values since 2011 in mid-month. It was the largest ever for the time of year in the second half of October. It became more elliptical in early November, affecting the Falkland Islands and South Georgia over November 4 and 5. The polar vortex was the largest over the past decade in the upper part of the ozone layer from July to October and the area with PSCs was also larger than average during this period. At some levels the vortex was largest, by a considerable amount, in late October and early November. It is not clear what effect, if any, the eruption from Calbuco in southern Chile had on the ozone values. It seems that most of the volcanic aerosol remained north of Antarctica. Antarctic ozone today: Ozone depletion remains extensive and the ozone hole still covers most of Antarctica, centered on West Antarctica. It is slowly beginning to shrink and is now around 16 million square kilometres. The ozone distribution is that of late mid spring with ozone amounts over the continent beginning to recover from their minimum, and higher values around the Southern Ocean. Values currently range from around 150 DU over the interior, to over 400 DU over parts of the Southern Ocean. There are significant differences between the various satellite measurements. Through most of the ozone layer temperatures are much below the long term average but are warming. Temperatures in the lowest part of the ozone layer are still below the threshold for Polar Stratospheric Cloud (PSC) formation over a small part of Antarctica and the area with PSCs remains significantly larger than average, but is rapidly decreasing. The polar vortex remains much larger than average in size, but is shrinking. The area of the ozone hole is expected to continue to shrink, but towards the end of next week it will again become more eliptical. The 2015 ozone hole: Meteorological conditions were favourable for the creation of a significant ozone hole, with a stable polar vortex. Ozone hole levels were briefly reached over the Antarctic Peninsula on August 5 and over Halley the next day in a dynamic event. Significant ozone depletion over the continent began in mid August as the sun returned. Depletion became more widespread by September, exceeding the mean for the last decade and greater than in the last couple of years. Ozone declined by about 1% per day near the centre of the ozone hole. 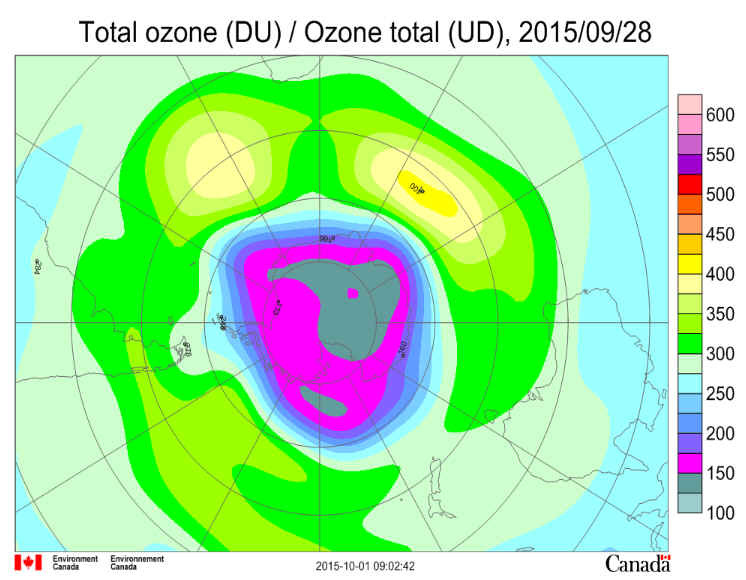 The ozone hole peaked at some 26 million square kilometres in the first half of October. Halley station saw its lowest ozone values since 2011 in mid-month. It was the largest ever for the time of year in the second half of October. It became more elliptical in early November, affecting the Falkland Islands and South Georgia over November 4 and 5. The polar vortex was the largest over the past decade in the upper part of the ozone layer from July to October and the area with PSCs was also larger than average during this period. NASA's Goddard Space Flight Center, Greenbelt, Md.-Oct. 29, 2015-The 2015 Antarctic ozone hole area was larger and formed later than in recent years, said scientists from NASA and the National Oceanic and Atmospheric Administration (NOAA). “This year, our balloon-borne instruments measured nearly 100 percent ozone depletion in the layer above South Pole Station, Antarctica, that was 14 to 19 kilometers (9 to 12 miles) above Earth’s surface,” said Bryan Johnson, a researcher at NOAA’s Earth System Research Laboratory in Boulder, Colorado. “During September we typically see a rapid ozone decline, ending with about 95 percent depletion in that layer by October 1. This year the depletion held on an extra two weeks resulting in nearly 100 percent depletion by October 15." The ozone layer helps shield Earth from potentially harmful ultraviolet radiation that can cause skin cancer, cataracts, and suppress immune systems, as well as damage plants. The large size of this year’s ozone hole will likely result in increases of harmful ultraviolet rays at Earth’s surface, particularly in Antarctica and the Southern Hemisphere in the coming months. Ozone depletion is primarily caused by man-made compounds that release chlorine and bromine gases in the stratosphere. Beginning in 1987, the internationally agreed-upon Montreal Protocol on Substances that Deplete the Ozone Layer has regulated these ozone-depleting compounds, such as chlorine-containing chlorofluorocarbons used in refrigerants and bromine-containing halon gases used as fire suppressants. Because of the Protocol, atmospheric levels of these ozone depleting compounds are slowly declining. The ozone hole is expected to recover back to 1980 levels in approximately 2070. This year, scientists recorded the minimum thickness of the ozone layer at 101 Dobson units on October 4, 2015, as compared to 250-350 Dobson units during the 1960s, before the Antarctic ozone hole occurred. Dobson units are a measure of the overhead amount of atmospheric ozone. The satellite ozone data come from the Dutch-Finnish Ozone Monitoring Instrument on NASA’s Aura satellite, launched in 2004, and the Ozone Monitoring and Profiler Suite instrument on the NASA-NOAA Suomi National Polar-orbiting Partnership satellite, launched in 2011. NOAA scientists at the South Pole station monitor the ozone layer above that location by using a Dobson spectrophotometer and regular ozone-sonde balloon launches that record the thickness of the ozone layer and its vertical distribution. Chlorine amounts are estimated using NOAA and NASA ground measurements and observations from the Microwave Limb Sounder aboard NASA’s Aura satellite. These satellites continue a data record dating back to the early 1970s. 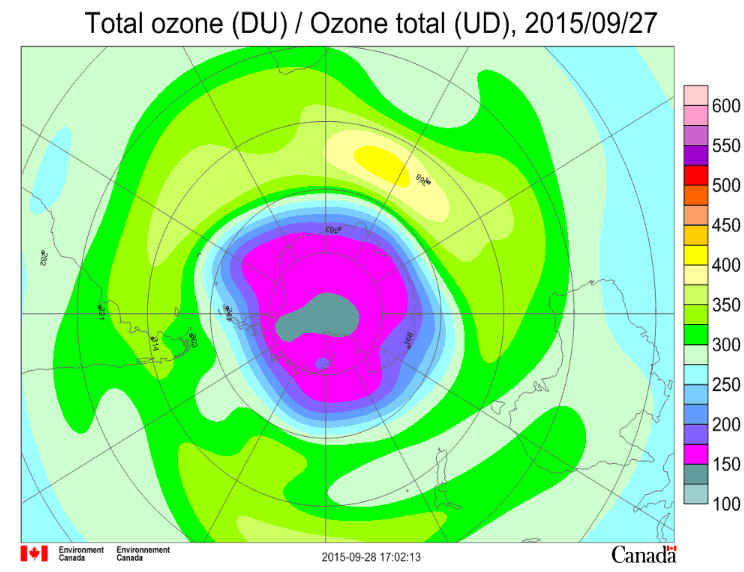 Antarctic ozone today: Ozone depletion remains extensive and the ozone hole covers most of Antarctica. The ozone hole grew rapidly from mid August onwards and peaked at some 26 million square kilometres in the first half of October. It is slowly beginning to shrink and is now around 23 million square kilometres. This is the largest hole that has been recorded at this time of year. The ozone distribution is that of late mid spring with ozone amounts over the continent beginning to recover from their minimum, and higher values around the Southern Ocean. Values currently range from around 130 DU over Dronning Maud Land, to nearly 400 DU over parts of the Southern Ocean. These highest values are lower than at the same time last year. There are significant differences between the various satellite measurements. Temperatures in the lower part of the ozone layer are still below the threshold for Polar Stratospheric Cloud (PSC) formation over parts of Antarctica and the area with PSCs remains larger than average, but is rapidly decreasing. Through most of the ozone layer temperatures are below the long term average but are warming and in the higher parts of the ozone layer are above the PSC formation threshold. The polar vortex is larger than average in size. The 2015 ozone hole: Meteorological conditions were favourable for the creation of a significant ozone hole, with a stable polar vortex. Ozone hole levels were briefly reached over the Antarctic Peninsula on August 5 and over Halley the next day in a dynamic event. 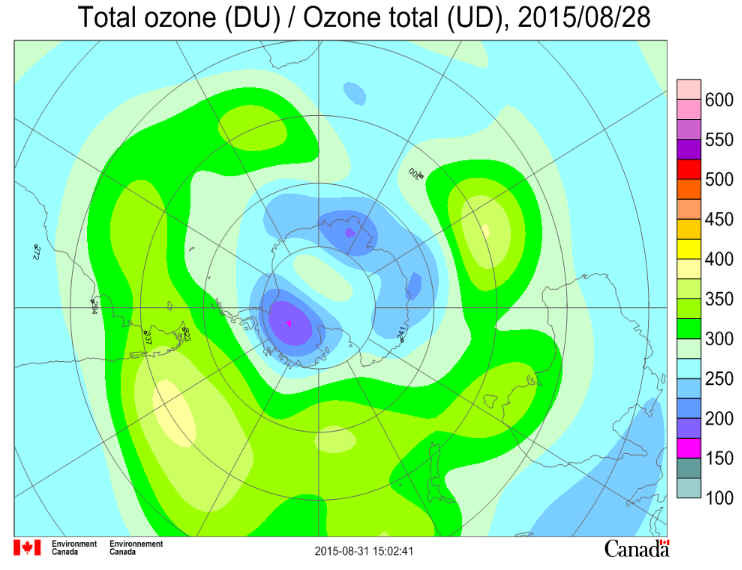 Significant ozone depletion over the continent began in mid August. Depletion became more widespread by September, exceeding the mean for the last decade and greater than in the last couple of years. Ozone declined by about 1% per day near the centre of the ozone hole. 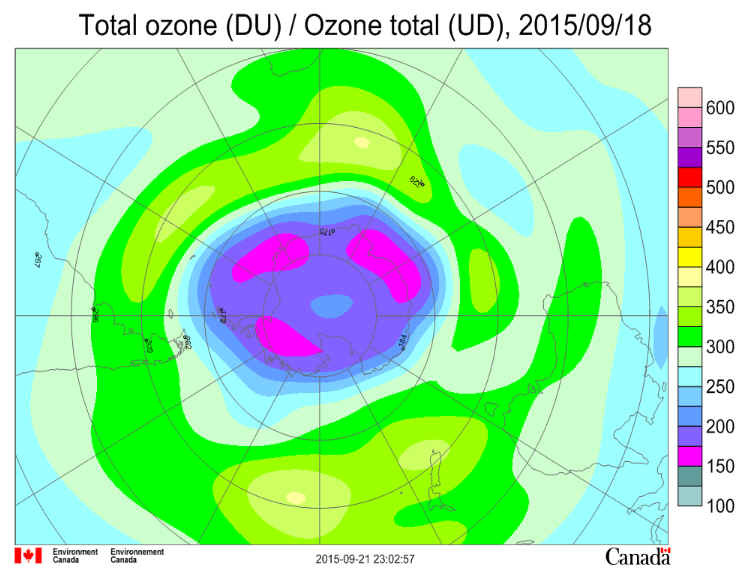 The ozone hole peaked at some 26 million square kilometres in the first half of October. It was the largest ever for the time of year in the second half of October. The polar vortex was the largest over the past decade in the upper part of the ozone layer from July to September and the area with PSCs was also larger than average during this period. Halley station saw its lowest ozone values since 2011. 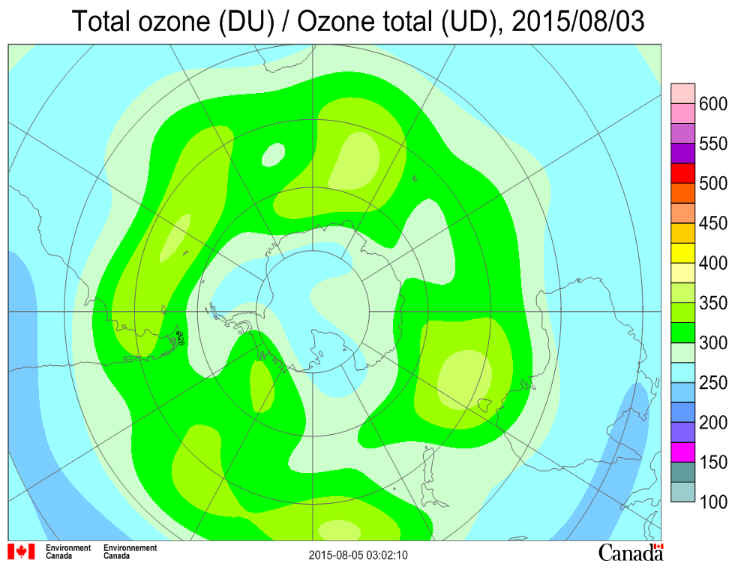 Antarctic ozone today: Ozone depletion is now extensive and the ozone hole covers Antarctica. The ozone hole grew rapidly from mid August onwards and is near its largest at some 25 million square kilometres. This is a larger hole than the average of those over the last decade. The ozone distribution is that of mid spring with lowest and still decreasing ozone amounts across the continent, particularly the Atlantic sector, and higher (and increasing) values around the Southern Ocean. Ozone is declining by about 1% per day near the centre of the ozone hole. Values currently range from around 130 DU over West Antarctica to near 400 DU over parts of the Southern Ocean. These highest values are lower than at the same time last year. There are significant differences between the various satellite measurements. Temperatures in the lower part of the ozone layer are below the threshold for Polar Stratospheric Cloud (PSC) formation over much of Antarctica and the area with PSCs is larger than average, but is now decreasing. Through most of the ozone layer temperatures are below the long term average but are beginning to warm and in the higher parts of the ozone layer are above the PSC formation threshold. The polar vortex is near average in size at most levels except the highest and lowest, where it is significantly larger than average. The 2015 ozone hole: Ozone hole levels were briefly reached over the Antarctic Peninsula on August 5 with significant depletion beginning in mid August. Depletion became more widespread by September, exceeding the mean for the last decade and greater than in the last couple of years. The polar vortex was the largest over the past decade in the upper part of the ozone layer from July to September and the area with PSCs was also larger than average during this period. It will be interesting to see if the eruption from Calbuco in southern Chile has any effect on ozone values when the southern spring progresses. To date most of the volcanic aerosol has remained north of Antarctica. Antarctic ozone today: Ozone depletion is now extensive and ozone hole levels have been reached across much of Antarctica. The ozone hole grew rapidly from mid August onwards and now covers some 25 million square kilometres. This is larger than the average of those over the last decade. The ozone distribution is that of early spring with generally lower and decreasing ozone amounts across the continent, particularly the Atlantic sector, and higher (and increasing) values around the Southern Ocean. Ozone is declining by about 1% per day near the centre of the ozone hole. Values currently range from around 150 DU over the Weddell Sea area to around 370 DU over parts of the Southern Ocean. These highest values are lower than at the same time last year. There are significant differences between the various satellite measurements. Temperatures in the lower part of the ozone layer are below the threshold for Polar Stratospheric Cloud (PSC) formation over much of Antarctica and the area with PSCs is larger than average. Through most of the ozone layer temperatures are below the long term average but are beginning to warm and in the higher parts of the ozone layer are above the PSC formation threshold. The polar vortex is near average in size at most levels except the highest and lowest, where it is significantly larger than average. The 2015 ozone hole: Ozone hole levels were briefly reached over the Antarctic Peninsula on August 5 with significant depletion beginning in mid August. Depletion became more widespread by September, exceeding the mean for the last decade and greater than in the last couple of years. Antarctic ozone today: Ozone depletion is now becoming extensive and ozone hole levels have been reached across over half of Antarctica. The ozone hole grew rapidly from mid August onwards and now covers some 22 million square kilometres. This is a little larger than the average of those over the last decade. The ozone distribution is that of early spring with generally lower and decreasing ozone amounts across the continent, particularly the Atlantic sector, and higher (and increasing) values around the Southern Ocean. Ozone is declining by about 1% per day near the centre of the ozone hole. Values currently range from around 180 DU over the Weddell Sea to around 380 DU over parts of the Southern Ocean. There are significant differences between the various satellite measurements. Temperatures in the ozone layer are below the threshold for Polar Stratospheric Cloud (PSC) formation over much of Antarctica and the area with PSCs is larger than average. Through most of the ozone layer temperatures are below the long term average but are beginning to warm. The polar vortex is near average in size at most levels except the highest and lowest, where it is significantly larger than average. Antarctic ozone today: Ozone depletion is now becoming more extensive and ozone hole levels have been reached across over half of Antarctica. The ozone hole covers some 15 million square kilometres. The ozone distribution is that of early spring with generally lower and decreasing ozone amounts across the continent and higher (and increasing) values around the Southern Ocean. Ozone is declining by about 1% per day near the centre of the ozone hole. Values currently range from around 190 DU to around 380 DU over parts of the Southern Ocean. There are significant differences between the various satellite measurements. Temperatures in the ozone layer are below the threshold for Polar Stratospheric Cloud (PSC) formation over much of Antarctica. Through most of the ozone layer temperatures are below the long term average but are beginning to warm. The polar vortex is near average in size at most levels except the highest, where it is significantly larger than average. The 2015 ozone hole: Ozone hole levels were briefly reached over the Antarctic Peninsula on August 5 with significant depletion beginning in mid August. Depletion became more widespread by September, approaching the mean for the last decade and greater than in the last couple of years. Antarctic ozone today: Ozone depletion is now becoming more extensive and ozone hole levels have been reached over parts of West Antarctica and the Weddell Sea. They were briefly reached over the Antarctic Peninsula on August 5. The ozone distribution is that of early spring with generally lower and decreasing ozone amounts across the continent and higher (and increasing) values around the Southern Ocean. Values currently range from around 220 DU to around 370 DU over parts of the Southern Ocean. There are significant differences between the various satellite measurements. Temperatures in the ozone layer are below the threshold for Polar Stratospheric Cloud (PSC) formation over much of Antarctica. Through most of the ozone layer temperatures are below the long term average and near their coldest, but are beginning to warm at the highest levels. The polar vortex is near average in size at most levels except the highest, where it is larger than average. Antarctic ozone today: Ozone depletion is now taking place and ozone hole levels were reached over the Antarctic Peninsula on August 5. The ozone distribution is that of winter with generally lower and decreasing ozone amounts across the continent and higher (and increasing) values around the Southern Ocean. Values currently range from around 240 DU over parts of the continent, to around 400 DU over parts of the Southern Ocean. There are significant differences between the various satellite measurements. Temperatures in the ozone layer are below the threshold for Polar Stratospheric Cloud (PSC) formation over much of Antarctica. Through most of the ozone layer temperatures are below the long term average and near their coldest, but are beginning to warm at the highest levels. The polar vortex is near average in size at most levels except the highest, where it is larger than average. Antarctic ozone today: The ozone distribution is that of winter with generally lower and decreasing ozone amounts across the continent and higher (and increasing) values around the Southern Ocean. Values currently range from around 230 DU over the Pole, to around 400 DU over parts of the Southern Ocean. There are significant differences between the various satellite measurements. Temperatures in the ozone layer are below the threshold for Polar Stratospheric Cloud (PSC) formation over much of Antarctica. Through most of the ozone layer temperatures are below the long term average, but are beginning to warm at the highest levels.